Robert Hirsch, one of the newest police commissioners and a mayoral appointee, was considered the swing vote in the decision whether to arm the San Francisco Police Department with Tasers. Hirsch, a lawyer who had long been a hearing officer in complaints against the police, had said earlier that he was concerned about the SFPD first implementing reform and de-escalation tactics. Taser opponents also argued that the SFPD needed more time for reform. A group of sheriff’s deputies positioned in the front of the room closed in on the 75-year-old grandmother, who is also a member of the Frisco 5, a group that began with a 2016 hunger strike that helped to undo Police Chief Greg Suhr and has lately grown — now they’re called the Frisco 500. Unfazed by the deputies moving in on her, Gutierrez went on. “Next speaker! Next speaker, please!” Turman called out as he tried to speak over her. A man dressed in black with a matching bandana around his neck burst down the center aisle, but was held back by Darby Thomas of the Democratic Socialists of America. And then Turman had had enough. He ordered the room cleared. The microphones were turned off and the rest of the commissioners left the room. The activists continued to speak anyway, holding for the next hour what one called “a people’s meeting.” It was filled with testimony that would be repeated an hour later, two flights up in Room 400, where the commissioners permitted five speakers at a time to enter the room. The first four speakers advocated for Tasers. They were followed by 40 who spoke out against Tasers. Most were from the Democratic Socialists and Frisco 500, but others were young San Francisco natives from the Bayview and Tenderloin neighborhoods — the populations that many felt would be most affected by Tasers. Hirsch had said that he was concerned about the disparity in how police treated African Americans, and he had decided to join the commission to be part of the solution. She and others wanted more time for that change to develop. As commissioners began to deliver their final statements, things were looking good for the activists — who had stayed for more than six hours. The three commissioners appointed by the Board of Supervisors appeared to be ready to reject Tasers. The mayor’s appointees — Thomas Mazzucco and Joe Marshall, appointed by Gavin Newsom, and Sonia Melara and Hirsch, by appointed by Ed Lee, had the majority. And, while most were expected to vote in favor of Tasers, Hirsch still seemed moveable. 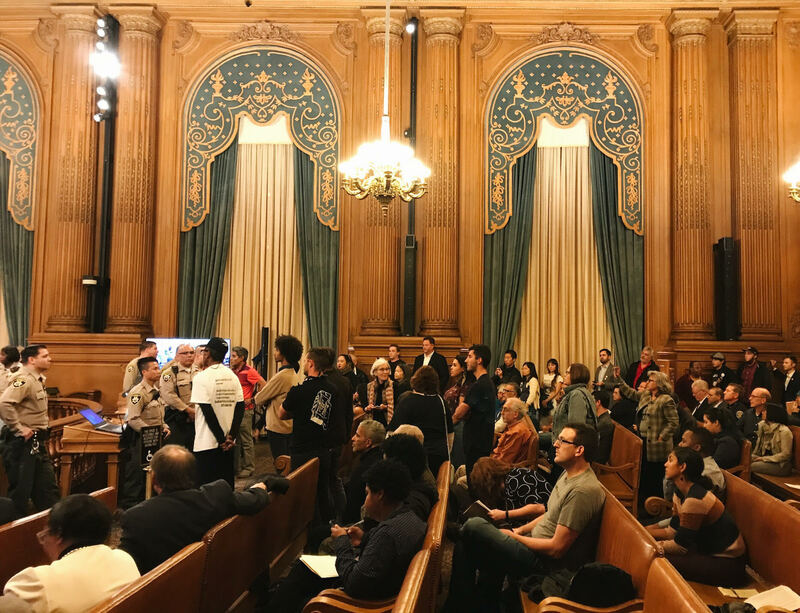 “The goal is to use as little force as possible,” Hirsch said, pointing to a recent report that showed the SFPD’s use of force was down this year. Those concerns were folded into a resolution to approve Tasers. The resolution says SFPD won’t deploy Tasers until December 2018. That gives the department two years to let its use-of-force training, which includes de-escalation techniques, to sink in. “Aye,” he voted on the resolution. “Sellout!” a woman shouted from the audience, as boos filled the room. Police Chief Bill Scott didn’t move for several minutes, his chin firmly supported by his left fist. Someone pointed out that all the “yes” votes were by Mayoral appointees. Chants of “F– Ed Lee!” filled the hallway. “Shame, shame, shame,” the activists chanted from outside, banging on the walls. They weren’t defeated nor deflated. The $8 million dollar price tag for Taser adoption could be fought at the budget level with the Board of Supervisors. Kaitlin Benz contributed to this report. PreviousAn eighth grader asks: is one measly lane enough for Rosa Parks?